The Julien and Boyer record car was a 'one-off' special, designed to attack the 500cc one hour record of 189.5km/h (average) set-up by Englishman John K. Brisse in 1953. Both Julien and Boyer had comprehensive automotive backgrounds. Henri Julien had founded AGS (Automobiles Gonfaronnaises Sportives) in 1968, first being involved with the construction of successful F2 racing cars and graduating to F1 in 1986. Bernard Boyer was a skilled race engineer that had experience with Matra cars at Le-Mans and World Sports car constructors championships. With the help of Michelin and Honda France, they designed and built a streamlined car with carbon fibre bodywork mounted on a lightweight tubular steel chassis. All four wheels were independently sprung. The very basic cockpit had a steering wheel, a temperature gauge, a rev counter and a single bucket seat. Power came from a V-twin cylinder Honda petrol engine of 499cc developing 60bhp and was transmitted through a six speed manual gearbox to a chain final drive. 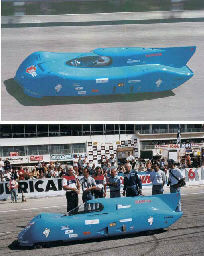 The car - painted French Blue - took the long-standing world record from Brisse at the CERAM track situated 40km from Paris in Mortefontaine, France on 3rd September 1997 with an average speed of 222.5km/h. It took four other small car records at the same time. The streamliner was bought by Brazilian collector, Mr. Abraham Kogan at a Christie's sale in Le-Mans in 2006 and was again sold by auction on 31st October 2007 for £15,400 by RM Automobiles of London.